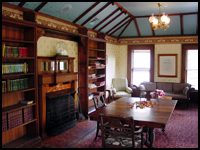 The library is located on the third floor of the Inn and overlooks the Middle Waterfalls. This meeting room will accommodate 10-14 persons at a conference table. $75.00 per day. Originally the estate's formal dining room, the Letchworth Room is located on the first floor of the Inn and overlooks a tranquil pond and fountain. A private veranda may be utilized as a break or reception area. The meeting room will accommodate 20-30 persons at round tables. $250.00 per day. 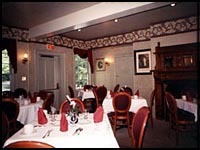 The Terrace Dining Room is located on the first floor of the Inn and looks out over the south lawns. This meeting room will accommodate up to 100 persons at round tables, has sound system capability and features a private entrance. $300.00 per day. Full catering services are available to any of these locations or to compliment your needs throughout Letchworth State Park. The Glen Iris Inn offers a wide variety of overnight accommodations.